You might think that only women worry about wearing the right type of hosiery for every occasion. Do they need to match your shoes? Are socks specific to an activity? Well, women, men have the same sock problems that you do. Have you ever wondered how many types of socks for men there are, or why it even matters? Let’s investigate the sock dilemma that all men could be facing as we speak! Your sock selection should match your wardrobe selection. If you are dressed in a suit, your socks should match the color of your pants. Are you wearing loafers or another casual style of shoe with jeans? Dark socks that pull your look together are always a good choice. Argyles or stripes, or any pattern, really, can also be worn with jeans or casual pants. Men who want to stand out from the crowd might choose a sock with a color or design. White socks should be saved for the gym or the tennis court. The different types of socks for men all have somewhat specific uses. 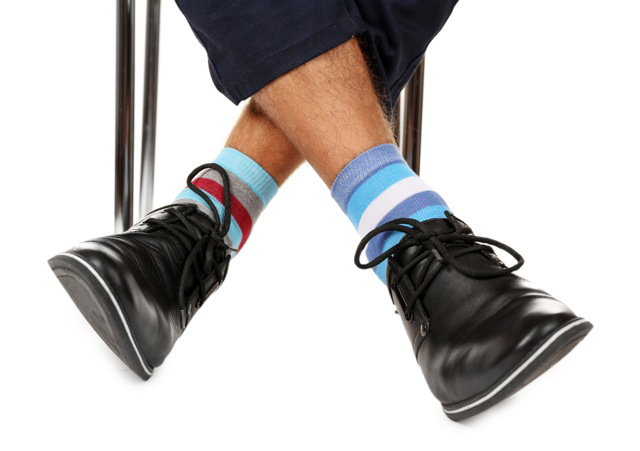 Tall socks are worn with dress pants so that when a man sits down, you will not see any skin. It lends a polished look to a nice outfit. Short or no-show socks can be worn with shorts and sneakers, for sports activities or for casual wear. Low socks prevent tan lines if you are working or playing outside. Depending on the color and material, mid-length socks can be worn in most situations. Men often have a preference for a definite style of sock that they will usually choose. Once you have begun to think about socks beyond the practical purposes, you will be amazed at the number of materials socks can be made from. And why would you care? Cotton socks are inexpensive, wear well, and can be tossed in the washer without much thought. They come in a variety of colors and styles and are probably the most common socks in a man’s dresser drawer. Wool is another practical sock choice. It’s a well-wearing and warm material, and wool socks are great for wearing outdoors. Silk socks are not for everyday wear but have a luxurious feel. However, they aren’t very durable. Then, there is cashmere. These socks are worn by men with a feel for the best that money can buy. They wear like wool but feel so much better. Just don’t throw them in the washer; they might not survive the spin cycle. It is best to choose socks that fit your wardrobe and your wallet. Basketball socks will not improve your performance, but they are made to make your feet happy. Extra padding on all the right parts give your foot a break from the pounding they can take in your basketball shoes. Compression socks are becoming quite popular with long-distance runners for their therapeutic value. It is believed that these garments lessen muscle fatigue and increase oxygen flow. Faster speed and decreased recovery times are also touted as benefits of these socks. Soccer socks are designed to reduce friction on the foot for comfort. They are tall enough to cover your shin guards and often have laces to tie them so they will stay up while playing. Baseball socks are usually colored to match the team uniform. They are knee-high, so the leg stays covered whether the pants are calf-length or full-length. If your laundry room is like so many others, you have a laundry basket full of different types of socks for men. If more than one guy lives at your house, that basket may be overflowing. Get yourself a SockSync (pre-orders available now here) to help you sort and fold your socks in no time at all. All of the time you save folding will give you a few extra minutes to choose the socks best suited to your next activity.